Disclosure: Paula Roland sent me a free copy of her DVD to review for this post. 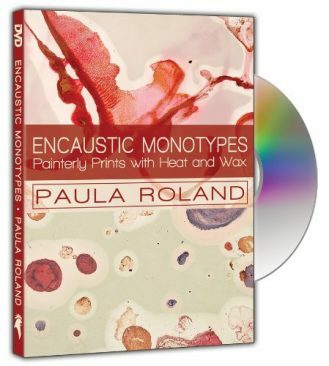 Encaustic Monotypes Painterly Prints with Heat and Wax is a beautiful instructional DVD by Paula Roland. In 2011 I took an encaustic monotype printmaking workshop in Toronto, this DVD was the refresher course I needed to jump back into encaustic monotypes. For those of us who live a distance from Santa Fe, the DVD is the next best thing to taking an in-person encaustic workshop with Paula. This DVD is a genuine pleasure to watch and Paula’s own prints are inspiring. Paula generously shares her expertise and enthusiasm for encaustic printmaking. The instruction is well-paced, clear and packed full of hands-on demonstrations. In addition to pulling prints, Paula demonstrates spot printing, working with stencils and how to further work on top of prints with stamps and various other mark-making techniques. Paula provides information on choosing paper and discusses saturation, paper absorbency and weight. I have worked with an anodized plate on a griddle but watching the DVD showed me how superior the Roland HOTbox is for encaustic printmaking. The Roland HOTbox that Paula redesigned and once produced and fabricated is now available exclusively through Vent-A-Fume. I highly recommend Encaustic Monotypes Painterly Prints with Heat and Wax to anyone interested in encaustic printmaking.